"You have created a thing of great beauty and ingenuity that happens to be perfectly practical as well, and I hope the realisation of such an object not only gives you a creative and intellectual pleasure but also provides you reward in the knowledge that it will be used and appreciated literally every single day." I began Wood Design Workshops in the Autumn of 1987, having spent the previous ten years teaching woodwork. In the years since, I have been designing and making, what I believe to be beautiful pieces of contemporary furniture which will give pleasure to their owners for many years. The vast majority of my work is made from solid hardwoods and uses time honoured methods of construction such as wedged mortice and tenons and handcut dovetails. Much of the work involves using more than one type of timber. This maybe to highlight a particular feature or to create interest by harnessing different colours or grain patterns. The timber I use is sourced from a variety of locations. Local sawmills provide much of the native wood, whilst specialist suppliers allow me access to the more exotic and rare species. I also collect trees, have them sawn at a local mill and then air-dry them outside my workshop. After a number of years outside they are finally conditioned in a kiln and then brought inside the workshop. It is pleasing to know the provenance of the tree that was used to make one's cabinet or table. To commission a piece of furniture, the starting point is either a visit to my workshop or by arranging a date for me to visit you. After an initial consultation I will produce a set of drawings and a firm quotation. A deposit of 33% is requested upon acceptance, the balance payable upon completion. It is hoped that clients will visit the workshop to see their commission being made. Delivery is invariably carried out by myself. Small items may be collected from the workshop. 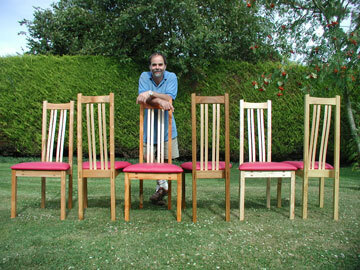 In 2003 I was awarded a coveted guild mark from The Worshipful Company of Furniture Makers for a dining chair in English ash and Borneo rosewood. In 2005 I was awarded membership of The Society of Designer Craftsmen.